This season Hyundai promises to make the fan experience better for football fans across the country. As an official sponsor of the National Football League (NFL), Hyundai will begin this initiative at the 2016 NFL Kickoff in Denver with exciting events for fans and a new creative campaign. Hyundai will be the presenting sponsor of the 2016 NFL Kickoff Concert in Denver. Hyundai will host local NFL Legends for autograph sessions, provide fans a fun green screen photo opportunity, offer giveaways including blue and orange sunglass and have interactive vehicle displays at Kickoff Village, the outdoor fan festival in Denver’s Civic Center Park. On Thursday, September 8, multi-platinum artists Dierks Bentley and OneRepublic will perform live in Civic Center Park at the 2016 NFL Kickoff Presented by Hyundai Concert. The concert is free and open to the public. Concert gates open at 3:00 p.m. MT, with performances beginning around 4:30 p.m. MT. Performances by Bentley and OneRepublic will be featured in simulcast coverage of the pregame show from 5:30-6:30 p.m. MT on NBC and NFL Network for all NFL fans to celebrate the start of the new season. 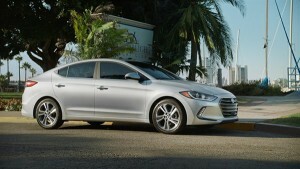 Hyundai’s on-site Kickoff activation is managed by Advantage International. Building on Hyundai’s creative from the 2015 season, the new campaign centers on how the brand celebrates fan passion for and loyalty to their NFL teams. Hyundai’s “Fishing Trip” 30-second spot, which will run during the season opener, shows how the new Elantra and its Proximity Key Entry with Push Button Start is the perfect vehicle for fans to enjoy game day easily and hassle-free. The spot features a diehard Miami Dolphins fan whose Sunday improves because of the vehicle’s innovative technology, organically demonstrating the connection between the brand and loyal NFL fans. “Choices,” another 30-second spot slated for kickoff day, also spotlights fan passion and loyalty. A Pittsburgh Steelers fan seamlessly cares for his infant and never misses a minute of the Steelers game because of the Hyundai Santa Fe’s 8-inch Touch Screen with SiriusXM Recording Feature. Both ads will run in NFL broadcast and online properties, and network game coverage throughout the season, as well as on Hyundai’s YouTube channel. These ads are just the first in a series of football-themed creative in a season-long celebration of the sport and its fans. Hyundai’s new NFL creative was developed by INNOCEAN USA.